Owning a home in an urban landscape brings a whole host of benefits. Restaurants, nightlife, theaters and museums are close by, and work is just a walk or light-rail ride away. Often, though, living in the city may mean the lack of a little nature. The good news is this: City planners and city-center developers are heeding the call for green space. Today, while parks are being incorporated into more urban neighborhoods, some developers are even including parks in their own communities. 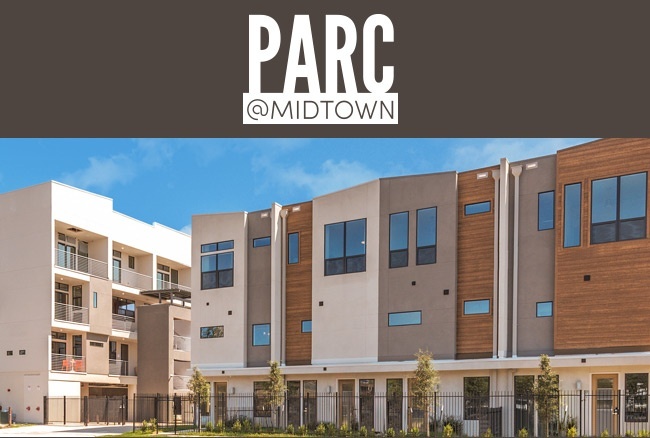 For example, Parc at Midtown, by award-winning developer Surge Homes, offers green space to spare! 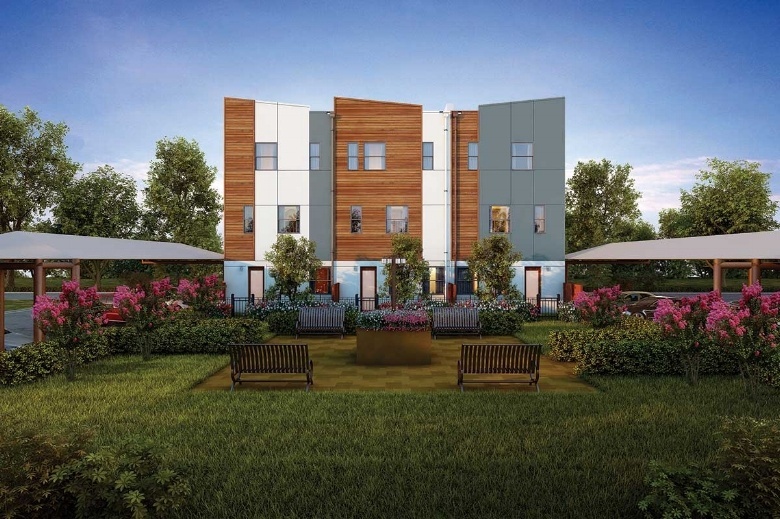 Its new townhomes offer private, fenced-in yards, and several also surround a 5,000-square-foot, residents-only park right in the middle of the community. Homeowners literally live in a park. All six of the park-adjacent townhomes are more than 1,500 square feet and – like all the townhomes in the community – offer 3 bedrooms and 3.5 bathrooms with a two-car garage. European-inspired interiors include high-end finishes, as well as exclusively imported cabinetry and all kitchen appliances with washer/dryer connections, engineered hardwood floors, backsplashes and quartz countertops. Homebuyers can choose from a large master en suite with either a garden tub and shower or an oversized shower with dual showerheads. Prices start at just $363,600. In addition to having access to their own exclusive park, homeowners can walk a few blocks to the impressive new Midtown Park. This six-acre site is a natural treasure in the middle of the city. 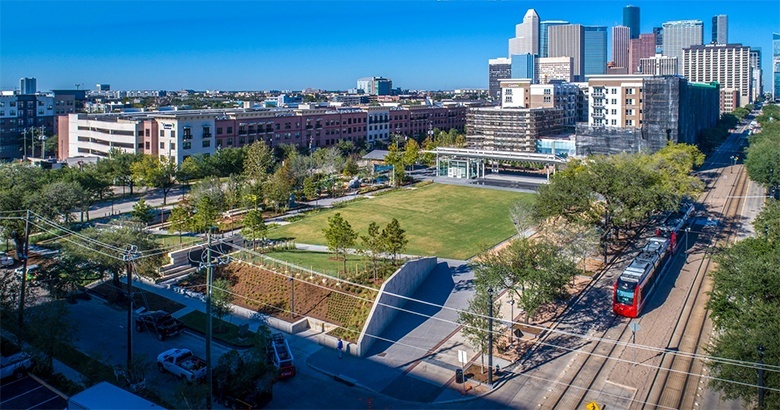 Lush landscaping, outdoor art exhibits, a designated dog run, playground, a stage for concerts and a “great lawn” for community events are just some of the amenities to enjoy. The jewel of Houston’s park system, Hermann Park, is just a few Metro stops away from Midtown and affords 285 acres of open space, bike trails, gardens, a golf course and Miller Outdoor Theatre. Concept rendering of a “Green Loop” encircling downtown with trails, parks and other green spaces. 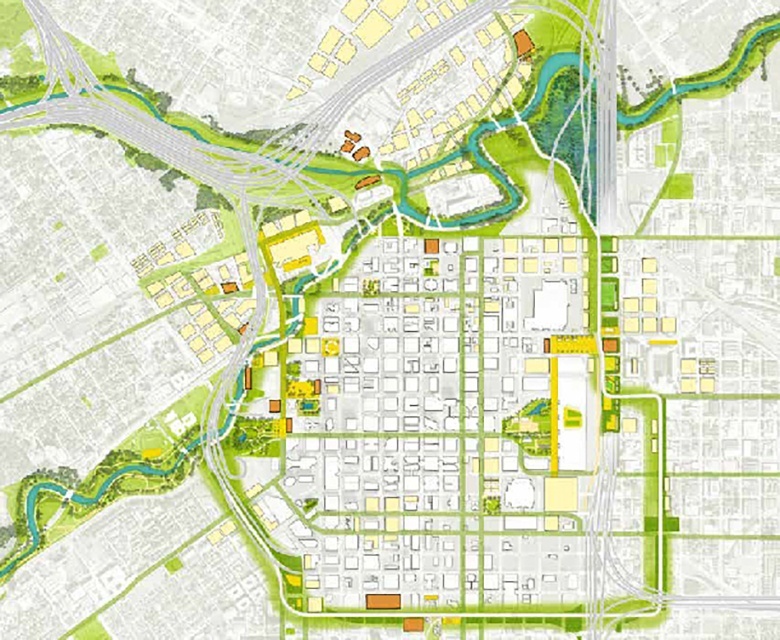 Also in the works is Houston’s Green Loop, a 5-mile network of parks, trails and other public spaces that will “loop around” downtown and connect the city center to surrounding neighborhoods, including Midtown. So, while living in the city center is a great choice for leading a walkable, bikeable, transit-oriented lifestyle, it’s nice that public green spaces – and private parks like the one in Parc at Midtown – are readily available to provide a welcome balance to the hustle and bustle.